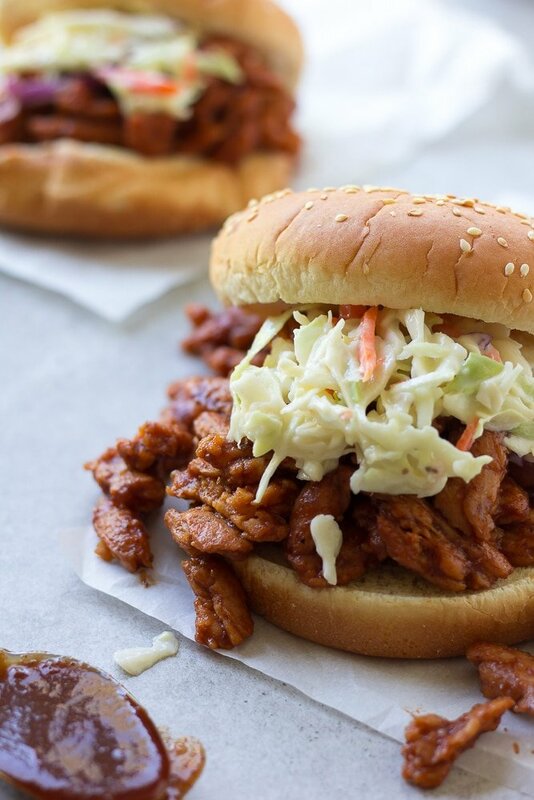 Truly the Best Vegan BBQ Sandwich, made with soy curls and ready in just 20 minutes. If you haven’t cooked with soy curls before, you’re missing out! Soy curls are made from whole soybeans, are non-GMO and have 10 grams of protein per serving. Perfect for potlucks, bbq’s or game day! 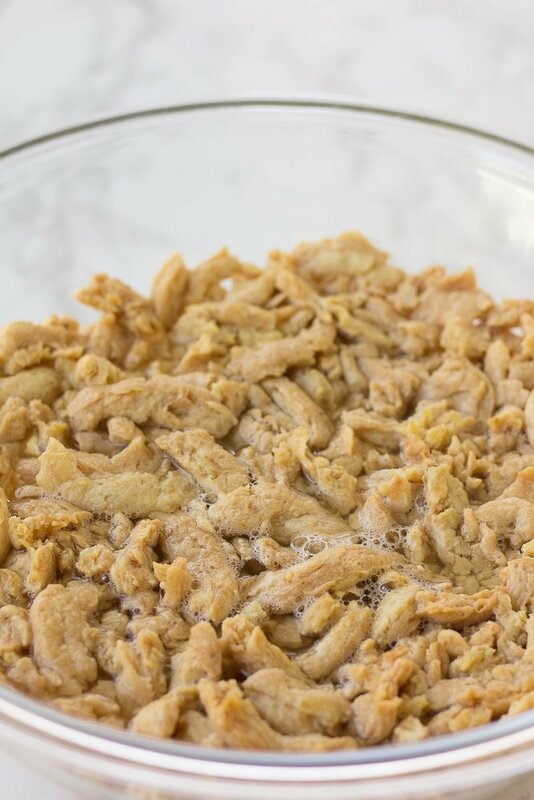 Have you tried soy curls yet? I’ve had them at various vegan restaurants before but only recently started playing with them at home, and let me tell you, I am impressed! I think they are one of the best meat alternatives around. Personally, I’m not a huge fan of the vegan meats out there, and I only eat them occasionally. I much prefer beans, tofu or tempeh. But I think these soy curls will have a regular place in our menu, and I’m excited to create more recipes with them! 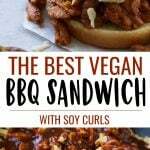 These Vegan BBQ Sandwiches with Soy Curls couldn’t be easier. First, you have to re-hydrate the soy curls by soaking them in warm water for about 10 minutes. Drain them, pull them apart a bit if desired, and add to a large pan, along with most of the bbq sauce. You can make my Quick and Easy Vegan Barbecue Sauce (I highly recommend it! ), or use your favorite brand from the store. Cook for about 10 minutes, stirring frequently, and then serve on buns or rolls with Classic Vegan Coleslaw. Delish! Well, you can decide for yourself, but I feel perfectly good about including them every so often in my plant based diet. They only have 1 ingredient, which is whole soybeans, so they aren’t that highly processed soy protein isolate, which a lot of the vegan meats out there are made of. I put them in the category of tofu or tempeh, which I also like to enjoy occasionally. This is the nutritional breakdown of Butler Soy Curls. As you can see, they’re a high protein and pretty low calorie food. What do soy curls taste like? Soy curls are so good! They are chewy and they really soak up the flavor of whatever you cook them in. These BBQ soy curls are chewy, juicy and have a great mouth feel. They will satisfy any bbq craving you have! BONUS: My kids love them! 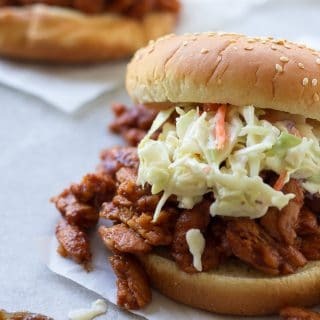 Truly the Best Vegan BBQ Sandwich, made with soy curls. If you haven't cooked with soy curls before, you're missing out! Soy curls are made from whole soybeans, are non-GMO and have 10 grams of protein per serving. Perfect for potlucks, bbq's or game day! Add the entire bag of soy curls to a large bowl, and cover with warm water. Let soak for 10 minutes to re-hydrate, and then drain the excess water. 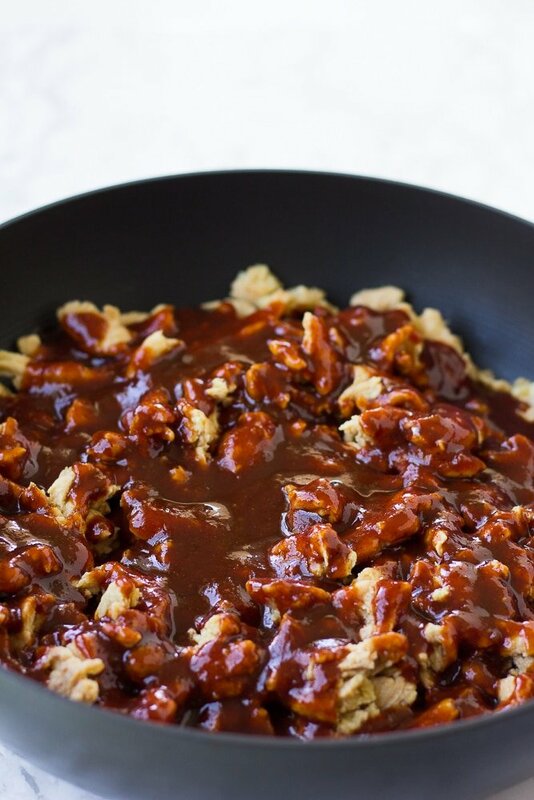 While the soy curls are soaking, make the Quick and Easy Vegan Barbecue Sauce, if using. Once drained, put them back in the large bowl and pull them apart with your hands to create a more "pulled meat", if desired. This step is not completely necessary, but I like them a bit smaller and pulled. Now, place the soy curls in a large frying pan. Add 3/4 of the barbecue sauce and cook over low-medium heat, stirring frequently. Remove from heat, and serve on buns or rolls with Classic Vegan Coleslaw, if desired. 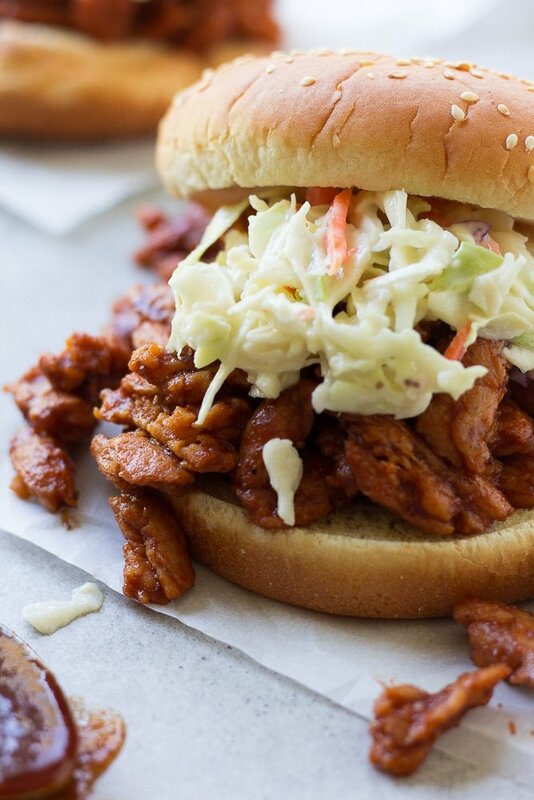 Nutritional calculations are for bbq soy curls only, not a bun or coleslaw.